Canada thistle (Cirsium arvense) is a perennial plant with extensive spreading roots that rapidly forms dense colonies. Vegetative shoots arise from adventitious buds located on Canada thistle roots. Canada thistle also spreads by seed; each shoot can produce more than 1,000 seeds. Plants grow from 1 to 4 feet tall and have spiny, lance-shaped leaves. Purple, lavender, or sometimes white flower heads typically appear from June to October. This noxious weed infests many habitats such as cultivated fields, roadsides and other non-crop areas, wildlands, and rangelands and pastures. It can often be found along stream banks or other waterways. The best way to control this weed is by applying effective, systemic herbicides. Most other methods of management do not give long-term control or kill the deep roots. 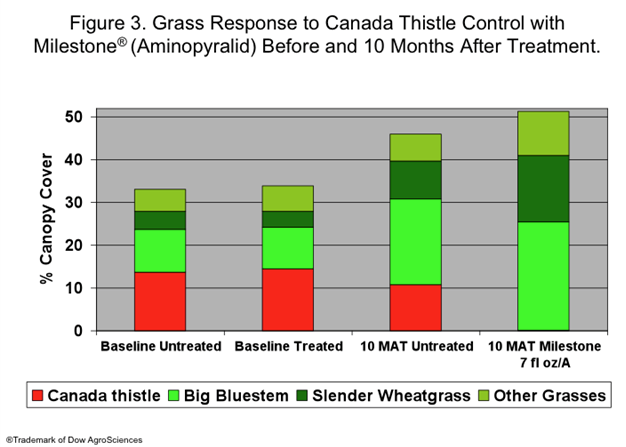 Research has shown that Milestone® herbicide provides more effective control of Canada thistle when compared with other herbicides. Canada thistle plants have extensive spreading roots that rapidly form dense colonies. Photo by Dr. Phil Westra, Colorado State University. Too early to treat–wait until early emerging plants are in the bud stage. Photo by Mary Halstvedt, Dow AgroSciences. Apply Milestone at 5 to 7 fl oz per acre in the spring after all plants have fully emerged (some plants may be budding), until the oldest plants are in full-flower growth stage. Figure 1 shows the summary of 36 research locations throughout the United States comparing control with selective herbicides applied to Canada thistle at pre-bud growth stage. Milestone at 5 and 7 fl oz/A provides 85 and 91% control respectively the year following treatment. 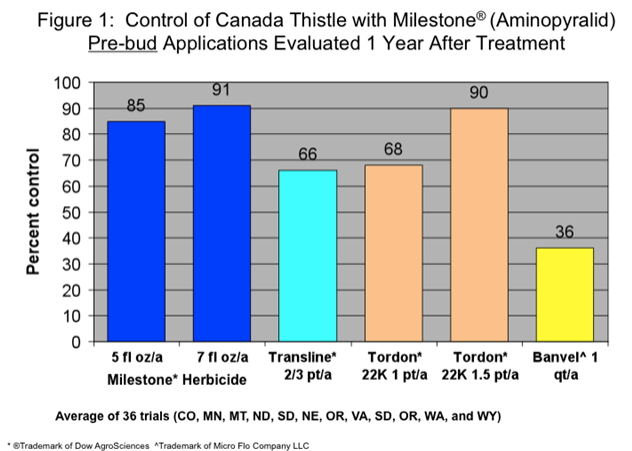 Additional field trials were established on Canada thistle to evaluate effects of Milestone at four application timings (bud, flower, seed-set (fuzz), and dormant growth stage) (Figure 2). Good control is obtained up to the full flower stage but decreases at the fuzz stage when many blooms are setting seed (see photo in graph below). Canada thistle can impact desirable grasses and forbs and form dense monocultures. Successful control may result in increased grass and improved habitat for wildlife that includes increased forage for big game and improved waterfowl nesting areas. Milestone is an excellent herbicide option in natural areas due to very low toxicity to birds, fish, mammals and aquatic invertebrates, and can be applied to seasonably dry wetlands and up to the waters edge. This graph summarizes the percent canopy cover of grass at a North Dakota State University research location. The baseline data shows percent canopy cover/plant composition before treatment for both treated and non-treated plots. Grass cover increased 46% 10 months after treatment (MAT) with Milestone at 7 fluid ounces per acre. Milestone herbicide is not registered for sale or use in all states. Contact your state pesticide regulatory agency to determine if a product is registered for sale or use in your state. When treating areas in and around roadside or utility rights-of-way that are or will be grazed, hayed or planted to forage, important label precautions apply regarding harvesting hay from treated sites, using manure from animals grazing on treated areas or rotating the treated area to sensitive crops. See the product label for details. State restrictions on the sale and use of Milestone apply. Consult the label before purchase or use for full details. Always read and follow label directions. Tordon 22K is a federally Restricted Use Pesticides. State restrictions on the sale and use of Transline herbicide apply. Consult the label before purchase or use for full details. Always read and follow label instructions. Active ingredients for products mentioned in this article. Product (active ingredient): Milestone herbicide (aminopyralid); Transline herbicide (clopyralid); Tordon 22K herbicide (picloram) Banvel and others (dicamba).